Ivy Baldwin’s balloon was a popular attraction at Elitch’s Gardens in the early 1900s but development of ballooning began years before. The first hot air balloon was launched in 1783, in Paris. The passengers were a sheep, a duck, and a rooster and they stayed in the air for a total of 15 minutes before the balloon crashed. Two months later, French brothers made the first manned flight, reaching an altitude of over 500 feet and flying for over 20 minutes. It soon became evident, though, that safely maintaining a fire to heat the air was difficult. Fires were frequent and flights were short in duration due to lack of fuel. In 1785, an attempt was made to fly a balloon across the English Channel using a combination of hot air and hydrogen but the balloon exploded. A successful attempt was accomplished the same year in a hydrogen balloon flown by Jean Pierre Blanchard and John Jeffries. The first balloon flight in America occurred in 1793 with George Washington on hand to witness. Blanchard flew from Philadelphia to Gloucester County, New Jersey and reached a height of 5,800 feet. Hydrogen gas is created using a combination of iron filings and sulfuric acid, first developed in 1776. Larger balloons, known as airships or blimps, were first built in the early 1900s and were filled with hydrogen gas. These cigar-shaped balloons had propellers and were designed to accommodate passengers or for military use. After the Hindenberg fire, their use waned. Military ships thereafter used helium, which was less explosive. Helium was very expensive, however, and not used for commercial purposes. In 1960, Paul E. (Ed) Yost used a propane burner system to hear air. Soon, ballooning became a sport with events across the U.S. Today’s balloons use either a combination of helium and hot air (for long distance flights) or the much more common hot air with use of propane burners. 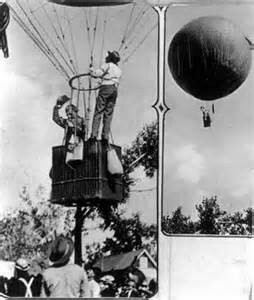 Ivy Baldwin and hi s Aerostat balloon became a feature at Elitch Gardens around the turn of the century (sources differ on the date, citing either 1897 or 1902—I897 is usually used). 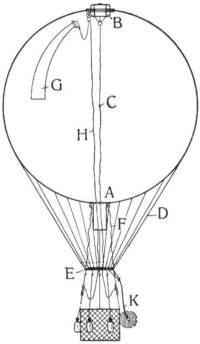 Baldwin made the military balloons used in the siege of Santiago during the Spanish-American War and supplied the Baldwin-Ziegler polar expedition with 40 small balloons for scientific experiments. The Aerostat, though, was the largest balloon seen in the West. Its bag was 65 feet in diameter and over 200 feet in circumference and was made with over 8840 yards of pongee silk. Five miles of rope was used in the net that enveloped the bag. Twenty tons of scrap iron and 20 tons of sulfuric acid were required to make the hydrogen gas to charge the bag. Because hydrogen was so expensive, Ivy Baldwin did not deflate his ball oon. Instead, it was tethered to the ground by a steel cable, attached to an 18-horse motor which pulled the balloon back to earth rather than the usual method of releasing hydrogen through the vent and rip panel. While the balloon was on the ground, Baldwin used four additional tether cables which ran from the head rail to the ground. The round willow gondola could hold 18 passengers and the cable allowed the balloon to reach a height of 1500 feet. Over the years that Baldwin was at Eltich’s, many couples got married in the balloon. Baldwin’s balloon gets a role in my upcoming book, Escaping Yesterday. 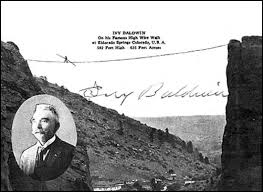 I vy Baldwin was a dare-devil as well as a balloonist. In addition to offering balloon rides, he performed a jumping act from the balloon. On one Independence Day, he jumped with lit fireworks strapped to his back, performing the stunt despite the danger with the hydrogen and lack of an asbestos suit (he ordered one but it failed to arrive in time). 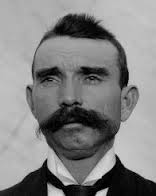 Over the course of his ten years at Elitch’s, he performed some 5000 jumps. Ivy Baldwin’s balloon gets a starring role in Escaping Yesterday. If you’ve been intrigued by this post, I hope you’ll pick up the book in September! Please join me next week for a glimpse into the early history of the Elitch Gardens Playhouse. Each Friday, I will blog about some aspect of Elitch Gardens, early Denver, or other topics related to my next novel, Escaping Yesterday. In between, I will post small factoids on my Facebook page. You can join me there and I love new friends (https://www.facebook.com/pamela.nowak.142).